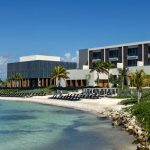 The all-inclusive Grand Velas Resort, a AAA Five-Diamond property, sits within acres upon acres of mangroves and lush jungle, culminating at a white, sandy beach along the Riviera Maya in Mexico. 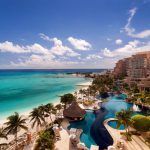 Although the resort is sandwiched between the nightlife-filled tourist scenes of Cancun and Playa Del Carmen, the vibe here makes it feel a world away. The resort’s lush jungle, over-the-top spa, and glistening pools provide all the relaxation and Mexican vibe you’d want from a getaway. 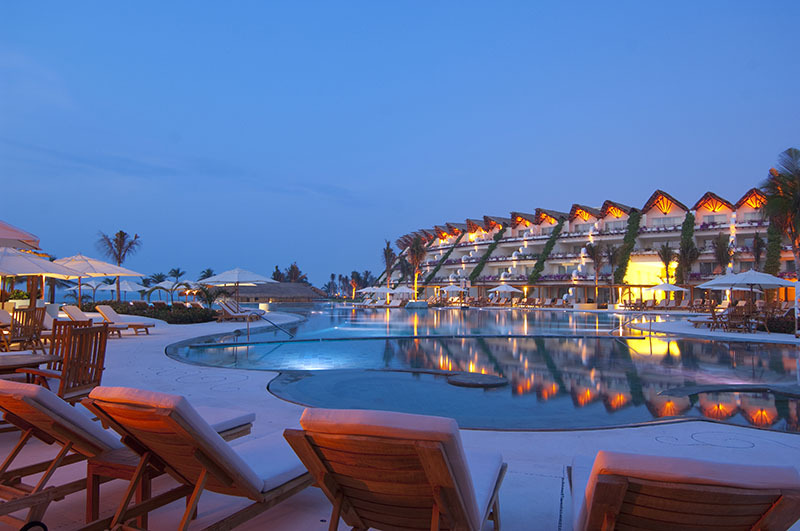 While its sister property, The Grand Velas in Nayarit on Mexico’s Pacific coast, is small and boutique, this Grand Velas features over 500 massive suites (each between 1,100 and 1,300 square feet) in three different sections; two family and one adult-only. 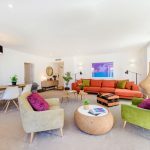 The first of the three sections you’ll approach, upon entering the property, is Zen, set deep in the jungle and a golf cart ride away from the beach. 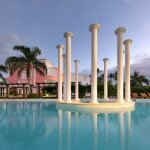 The spa is located here as well and, at almost 90,000 square feet, is the largest spa in Latin America. As its name suggests, Zen is very tranquil, although it is family-friendly. The pool is beautifully-lit and the grounds are perfectly landscaped (as is the entire resort). The other two sections, the Ambassador and the Grand Class, sit side-by-side and are located along the beach. Ambassador is family-friendly and Grand Class caters to adults only, each with its own beautiful pool. While I was staying at the Grand Class, I opted to spend my days at the Ambassador section. The pool there is magnificent and the vibe is a bit livelier. As an FYI, I found the children at the entire resort to be extremely well behaved and basically a non-issue. The Ambassador section has both a teen club and a kid’s club. The teen club is so futuristic and cool that I even noticed a few parents playing some of the video games. 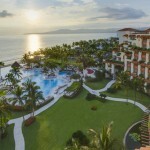 However, the real jewel at this all-exclusive resort is the dining options. While some were better than others, they were all exceptional. You’ll find each dining experience more of an “event” from beginning to end, with the waiters instinctively fulfilling your every need. 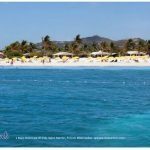 Although their French offering, Piaf, was the standout for me, Cocina de Autor is the first restaurant at a luxury all-inclusive resort to receive Five Diamonds by the AAA. 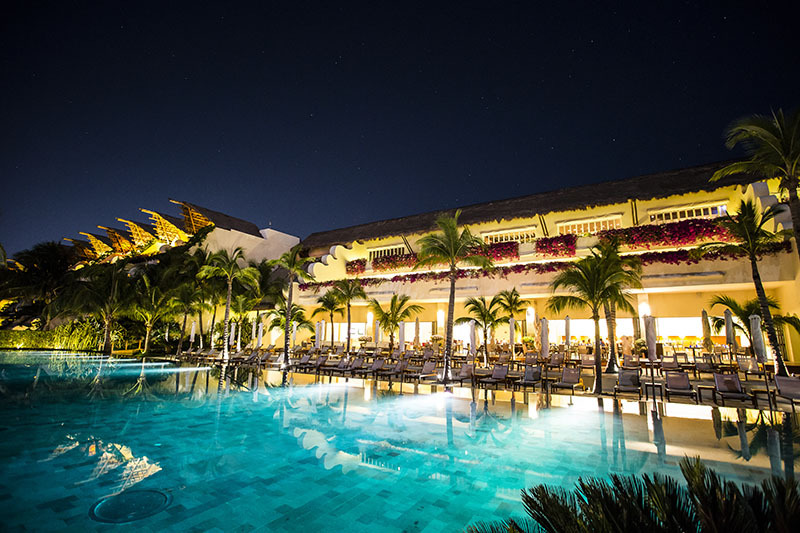 In a nutshell, the Grand Velas Resort and Spa serves up the perfect balance of luxury and casual ambiance. 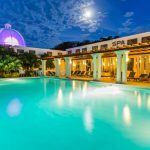 From their karaoke nightclub, locally inspired spa treatments, and poolside foot massages to the array of activities and fitness classes, this is one fantastic retreat for the entire family.